If you measured the highest point in each county, which of the fifty states would have the highest average elevation? You probably didn’t say Utah, but in fact the average elevation of the state’s county high points is approximately 11,222 feet (Colorado is second at 10,971 feet). Most but not all of Utah’s high peaks grow out of a series of mountain ranges that form a backbone from north to south through the middle of the state. Surprisingly, most can also be climbed in a day, and during the warm months climbing gear may be unnecessary. Some summits are even attainable by car. 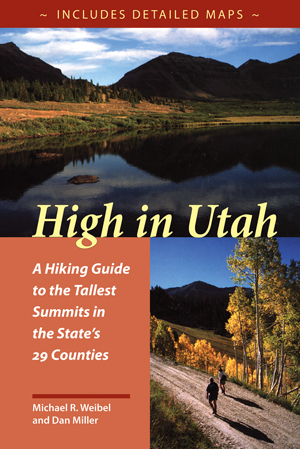 High in Utah is quite consciously a book for peak baggers, complete with a checklist and elevations. Summits range from Kings Peak, Utah’s highest at 13,528’ to the unnamed peak in Rich County, a mere 9,255’. In addition to the county high points, this book also has four “classic” climbs: Mt. Olympus in Salt Lake County; Mt. Timpanogos above Provo; Notch Peak in the House Range west of Delta; and Wellsville Cone, Cache Valley’s western landmark. Since finding a place to start can often be the most frustrating part of a hike, emphasis is placed on directions to each trailhead. There is a road map for each hike, as well as a trail map showing contours. The routes in this guide are not always the easiest or most practical, but they may be the most appealing and are often the most commonly used (lessening human impact on other potential routes). Difficulty levels range from 'extreme'—long, steep routes that may require some route finding—to 'too easy'—reachable by car. Two sets of hiking times are provided to accommodate variations in hiking speed, and there are also sections on flora and fauna, mountain weather, low-impact hiking and camping, equipment, and altitude sickness. "Alaska is our biggest, buggiest, boggiest state. Texas remains our largest unfrozen state. But mountainous Utah, if ironed out flat, would take up more space on a map than either." Michael R. Weibel is senior reporter for the Herald Journal in Logan, Utah. Dan Miller is a freelance photographer and designer.